Playing pool is a favorite pastime for many people, age notwithstanding. Many a people have pool tables in their homes, and many more intend to acquire one. In order to deliver a great game experience, the pool table needs to be firm and level, so as to minimize unwanted drift of the balls. This calls for careful handling of the pool table during its disassembly, transit and reassembly. So you have finally bought your dream pool table and you are excited about playing pool in your house. Fine. 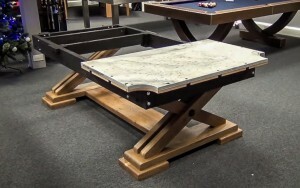 Have you thought about the pool table assembly? You might need a professional pool mechanic to assemble it for you, but you can do that yourself if you follow this pool table installation guideline. First, make sure that the room where you intend to have the pool table reside is spacious enough to both accommodate the table and leave enough room for a quality game experience. Just before moving in the pool table, clear the path to this room. Bring in the frame, flip it upside down (you will surely need help for this) and fasten the legs in to their rightful positions. Flip it back upright and put it in the position you intend it to stand. Next is the slate. To say the least, it’s the most delicate and most difficult part of the pool table to install. They came in two types: a single piece slate or a three-piece slate. A single piece slate is easier to install than a three-piece slate. Whichever type you have, move the piece(s) onto the frame. Fit it onto the frame carefully and nicely, while taking care of not only the slate but also your fingers. If you have the three-piece type, you can visually figure out which piece goes where. At this point you will need to use a machinist’s level to make sure that your table is really flat. After you’re done leveling, it’s time to put in place the felt. On the felt, cut out holes through which the bolts will go. Using a metal paint scraper, eliminate the creases and push out any air bubbles trapped underneath the felt. You might need to spend considerable time doing this, but the resulting shot quality will justify the effort. See our very detailed guide on refelting a pool table here. Then, the rails go into position. Tighten them meticulously and close the gaps, all the while taking care not to reintroduce the creases you have already removed from the felt. Mostly likely dog-tired by now, you are through with your pool table set up. It is needless to say that pool table assembly is incomplete without leveling. At times, you will need to do leveling during play time, when you notice signs that imply that your pool table is slanted, albeit imperceptible to the eye. 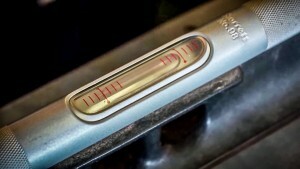 Thus, it is imperative as a pool owner that you know how to level a pool table. ng easy and fast. In absence of either of the solutions above, you can use wooden pool table shims, which can be easily acquired from pool table dealers. Here is how it is done. Using a leveler, check which side of the table is lower than it should be. Add shims beneath these areas. In case you are dealing with a table with adjustable legs, remove the screws holding the legs in place and move the leg appropriately. Don’t forget to put the screws back in place. The process of leveling the table should be gradual, with subsequent checks using a leveler until the perfect level is attained. When moving a pool table, it’s best to disassemble it. Here is a quick guide on how to dismantle a pool table. First, remove the staples from the underneath pockets using a staple remover. If you don’t have a staple remover, a flathead screwdriver will suffice. You might have to get down and dirty to accomplish this, so improvise protective gear. Next, unscrew the bolts holding the side rail to the table (there are usually three bolts per rail on a standard pool table) and then lift off the rail. After removing the rails, you will need to remove the felt – the colored cloth covering the playing surface. It can be either stapled or glued onto the surface. If glued, you will need to take great care to unpeel it. For the stapled type, remove the staples using either a staple remover or needle nose pliers. Be especially careful while working near the pockets, which can be tricky. It’s advised that you pull felt off the surface in a backward motion, so as to prevent it from stretching. With the felt off the table, fold it neatly, avoiding creasing it and depressing the folded edges. Now, you are almost done, but at the most critical point of the pool table disassembly process. This is because the integrity of the game is largely dependent on the slate. At this point, you should be able to tell whether the slate is one giant structure or an assembly of three pieces. Usually, there is one screw at each of the slate’s corners. At times, you will find screws at the center beam. Some clever designers cover the screw heads with beeswax to create an even surface. You will need a sharp eye to spot these. Unscrew the slate appropriately and lift it off the legs. Lastly, remove the legs. Since disassembling a pool table takes professional pool mechanics around two hours, it will most probably take you more. After everything is done, you should organize and pack all the pieces carefully for their transport. Moving a pool table can cause it to be unbalanced, or worse still, its slate top could break. Thus, moving a slate pool table on to a truck needs to be accomplished with flawless caution. Wrap the slate with a blanket and set it in the vehicle carefully. Wrap the frame with a drop-cloth and load it into the vehicle. You can place it on top of the slate. Stack the other pieces on top of each other, but be sure to fasten them firmly so that they don’t damage one another. You are now set to safely move to your new location. Transit of pool tables is such a delicate job that it has given rise to specialist pool movers. Their trucks are highly customized for the job. Depending on the distance and work to be done on the pool table (assembly and disassembly), the pool table moving cost in the US will generally range anywhere between $200 and $600. Different pool movers will have packages with attractive perks to attract customers. These include transit insurance, blankets to wrap the different pieces for a shock-free journey and weather proof box trucks. Every state has at least half a dozen pool table movers. If you intend to transport your pool table, you will surely have, at your disposal, a number of service providers to choose from.